Opaque pink with a mottled gold-luster coating. Please note that the mottled gold coating on these beads doesn't show up very well in the picture. 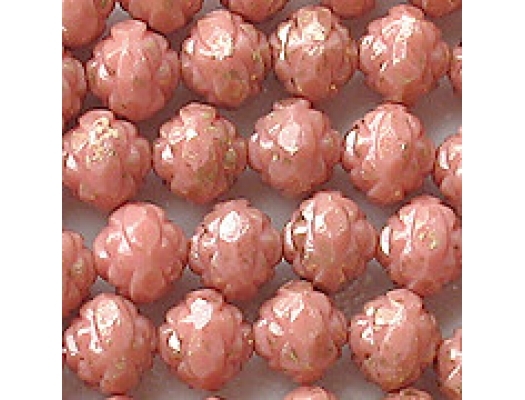 Also, the beads can look somewhat dull in low light; they require bright light to look their best. These are very attractive beads. However, are they premium quality? 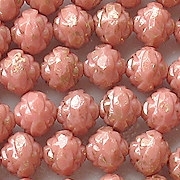 I carry many other faceted rosebud beads which are much cheaper. 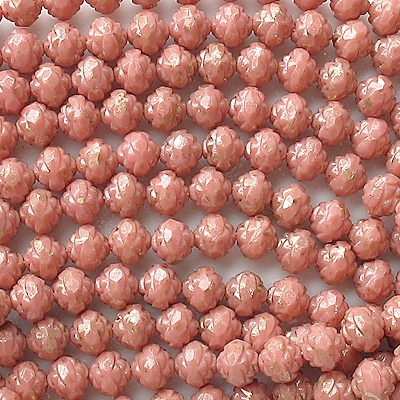 The supplier, however, saw fit to put a price on these beads which is more than double the price of other rosebud beads, and I have no choice but to pay it. Since these are attractive beads, I decided to get them and let my customers decide whether to spend the extra money. There's no doubt that the supplier's price is inflated, although it's true that opaque colors cost a little more to manufacture. This kind of "premium pricing" really gets me steamed. On the other hand, if they didn't use premium pricing on some beads, then all the other beads would probably be more expensive.